The lady walks into the huge stadium where you are waiting for her. The light is dim, you are dressed in your best suit with a bunch of red roses in your hands and two spot lights are following you and her as both of you approach each other. You clap once without removing your gaze from her and another spotlight focuses a group of musicians who start playing violins! You bend on your knees, offer her the red roses, draw a beautiful ring from your pocket, and say, "Will you marry me"? Well, I know all this sounds heroic, but trust me, these dramatic and complex marriage proposals fit only movie scenes. 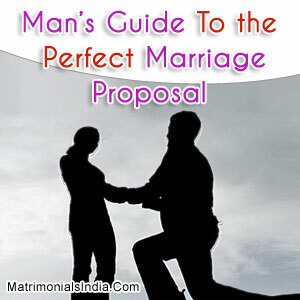 Real life demands a lot more sincere approach towards marriage. You cannot even think of proposing her for marriage without taking ample time to consider all important facets. Have you had ample discussions about life, marriage, priorities after marriage and other important things like career, etc. with her? Are you confident that she is ready? Have you met each other's families and are they aware and in agreement to your relationship? Marriage is an institution that requires loyalty, responsibility and a life-long commitment. Are you ready for this? Are you a 100% sure that she is the one? If you know the answer to these key questions clearly and if the answers encourage you to proceed with the proposal, then go for it! Real life marriage proposals should be sweet, simple and private unlike the gala proposals of movies. Complex proposal plans might ruin your moment if even a single thing goes wrong. Moreover, Indian girls are shy; they like to be in private with their partners at such moments. Place : You could take her to one of her favourite places but be sure it is not too crowded. Timing : Make sure it is the right time to propose. Special effects : You could wear her favourite shirt or her favourite colour to add special effects. Always keep one thing in mind, marriage proposal will be one of the most important moments for both of you, so make it sweet and special for her as well as for yourself.